For other uses, see Night on Earth (disambiguation). Night on Earth is a 1991 film written and directed by Jim Jarmusch. 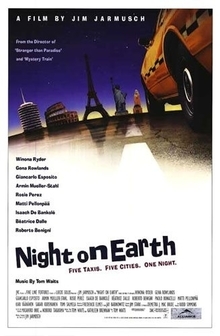 It is a collection of five vignettes, taking place during the same night, concerning the temporary bond formed between taxi driver and passenger in five cities: Los Angeles, New York, Paris, Rome, and Helsinki. Jarmusch wrote the screenplay in about eight days, and the choice of certain cities was largely based on the actors with whom he wanted to work. The soundtrack of the same name is by Tom Waits. As evening falls, tomboy cabby Corky (Winona Ryder) picks up Hollywood executive Victoria Snelling (Gena Rowlands) from the airport, and as Corky drives, Victoria tries to conduct business on her phone. Despite their extreme differences socially, the two develop a certain connection. When Victoria suggests that cab driving is not much a career, Corky counters that her dream in fact is to become a mechanic. During the ride Victoria, who is evidently a talent scout, comes to realise that Corky would be ideal for a part in a movie she is casting, but Corky rejects the offer because she intends to be a mechanic. Helmut (Armin Mueller-Stahl), an immigrant from East Germany who was a clown in his home country, has found work as a taxi driver. After dark, he picks up a passenger named YoYo (Giancarlo Esposito), a streetwise young man who wants to go to Brooklyn. Increasingly alarmed at Helmut's inability to handle automatic transmission, ignorance of New York geography and feeble command of the English language, YoYo takes over the wheel. During the drive, YoYo sees his sister-in-law Angela (Rosie Perez) on the street and forces her into the cab to take her back home. Helmut is clearly amused by the vituperation between the two. After Angela and Yoyo depart, Helmet struggles to drive back to Manhattan, muttering "New York...New York." At night, a cab picks up two drunk African diplomats, who mock the lowly driver (Isaach De Bankolé) and find it hilarious that he is from the Ivory Coast. In French, when he says he is ivoirien, they say il voit rien (he can't see a thing). Sick of their insults, he throws them out without making them pay. Next he picks up an attractive young woman (Béatrice Dalle), who is blind. As she cannot see the colour of his skin, he asks her where she thinks he is from. After a moment's thought, she says the Ivory Coast. Prickly and sexually provocative, she rejects most of his efforts to be friendly, regarding him as beneath her, but he is genuinely fascinated by her and her predicament. So much so that, after dropping her off, he watches her walk beside a canal in the dark and drives into another car, whose driver angrily accuses him of being blind. In the early morning hours, an eccentric cabbie (Roberto Benigni) picks up a priest (Paolo Bonacelli). As he drives, he starts to confess his sins. Much to the priest's discomfort, he goes into great detail about how he discovered his sexuality, first with a pumpkin and then with a sheep, then details a love affair he had with his brother's wife, miming the actions and mouthing the cries. Already ailing, overwhelmed by the barrage of unwanted information, the priest has a fatal heart attack. Unable to revive him, the cabbie leaves him on a bench to be found once it is light. After an evening spent drinking heavily, three workers (Kari Väänänen, Sakari Kuosmanen, and Tomi Salmela), one of whom has just been fired from his job and has passed out, climb into a cab to return home. On the way, the two conscious workers talk about the terrible situation their unconscious friend is in, being out of work and having to face a divorce and a pregnant daughter. The driver, Mika (Matti Pellonpää), then tells them all the saddest story they have ever heard. The workers are terribly moved and depressed by the story, and even become unsympathetic toward their drunken, laid-off companion. Leaving him in the cab, they stagger off to their homes. Mika wakes him, takes payment and leaves. Worker sits on the ground, passing neighbours greet him and he replies back. Review aggregator website Rotten Tomatoes retrospectively gave the film an approval rating of 75%, based on 24 reviews, and an average rating of 6.3/10. ^ Andrew, Geoff (1999-11-15). "Jim Jarmusch interviewed by Geoff Andrew". The Guardian. Guardian Media Group. Retrieved 2008-05-02. ^ "Night on Earth (1991)". Rotten Tomatoes. Fandango Media. Retrieved April 10, 2018. Bernd Wahlbrinck (2011). Jim Jarmusch's Night on Earth: The New York Episode. Germany: Tumbleweed. ISBN 978-3-00-035771-8. This page was last edited on 25 April 2019, at 00:31 (UTC).